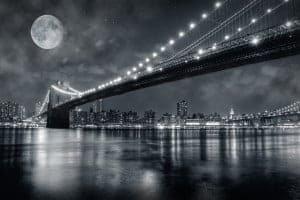 This post is in response to a question from Matthew Tapley, who is interested in learning how to improve his black and white photography skills. I hope this article has information that is valuable enough to you that you'd consider sharing it on Facebook or Twitter. Black and White Photography Tip #1: Shoot in RAW. Many times when I shoot for black and white, the photo just doesn't turn out right when I finally review it on the computer. By shooting in RAW, you'll be able to change your mind later if the photo wasn't as great in black and white as you'd hoped. 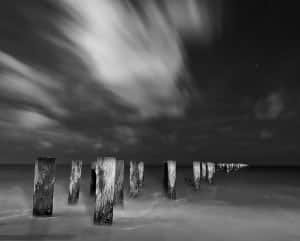 Black and White Photography Tip #7: Use a polarizer. When shooting around reflective surfaces such as water or leaves, use a polarizer to cut the reflections of the sun's light. When color is removed from the photo, these specular highlights can be distracting the overall composition. Black and White Photography Tip #10: Look for patterns. Patterns are interesting because of their ordered repetition. Color merely distracts us from giving the pattern our attention. By using black and white, images of patterns are far more compelling. Once you start looking for patterns to shoot in black and white, you'll notice them everywhere: cars in a parking lot, the shoes of a wedding party standing in line, or a row of bushes. Black and White Photography Tip #11: Long exposures love black and white. I read this tip on the fantastic Digital Photography School website and decided to try it on an image that I took a few months ago. I didn't like the picture and had almost deleted it until I read that tip and applied black and white to the photo. Black and White Photography Tip #12: B&W isn't a replacement for bad lighting, but it can soften the blow. The photo of the deer on this page is an example of a photo that looked terrible in color, but which looks nice in black and white. I shot the photo at high-noon. Because I used a polarizer, I was able to cut out the reflections on the leaves and mask the fact that it was shot in terrible light. Black and White Photography Tip #13: Don't get fooled. I confess to have made this mistake many times. Sometimes I have shot a photo that includes very little color. For example, a close-up of a penguin, or a night sky, or a dalmatian dog. When I see these photos in Lightroom, I often reach for the black and white tools immediately, but I am always disappointed. If the photo is practically colorblind to begin with, it probably won't look as good in black and white as in color. Black and White Photography Tip #14: Shoot in HDR!!! I'm actually surprised how little attention is given to black and white HDRs on the web. I am so convinced of the merit of the black and white HDR that I spent an entire chapter in my HDR eBook talking explaining how to do it. HDR is great for black and white photography because it exaggerates the dynamic range and edges. Nothing pops quite like a black and white HDR. If you like these daily photography articles, you should LIKE us on Facebook, so they will appear in your facebook feed each morning. Here's a link to our facebook page.